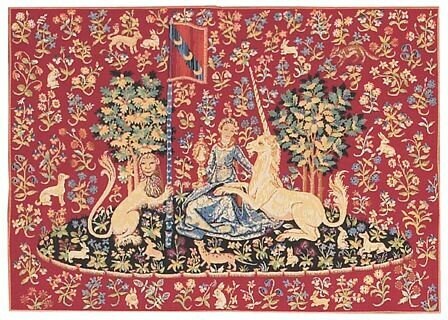 This Museum Collection wall tapestry shows a The Sight, which is part of The Lady and the Unicorn (French: La Dame à la licorne) a series of six tapestries woven in Flanders from wool and silk, The set, on display in the Musée national du Moyen Âge (former Musée de Cluny) in Paris, is often considered one of the greatest works of art of the Middle Ages in Europe. Five of the tapestries are commonly interpreted as depicting the five senses – taste, hearing, sight, smell, and touch. The sixth displays the words "À mon seul désir". The tapestry's meaning is obscure, but has been interpreted as representing love or understanding. Each of the six tapestries depicts a noble lady with the unicorn on her left and a lion on her right; some include a monkey in the scene. The pennants, as well as the armour of the Unicorn and Lion in the tapestry bear the arms of the sponsor, Jean Le Viste, a powerful nobleman in the court of King Charles VII. However, a very recent study of the heraldry appears to lend credence to another hypothesis - previously dismissed - that the real sponsor of the tapestry is Antoine II Le Viste (1470-1534), a descendant of the younger branch of the Le Viste family and an important figure at the court of Charles VIII, Louis XII and François I. The tapestries are created in the style of mille-fleurs (meaning: "thousand flowers").. This wall tapestry is woven in Belgium on a jacquard loom with 98% cotton thread. It is lined with a blue cotton backing and is finished with a rod sleeve. The gobelin quality is obtained by a denser, thicker weft and as such is somewhat heavier than the regular tapestry quality. PERFECT !!! Amazing detailed and great quality. This surpasses my imagination. I am a very happy customer. I highly recommend your shop. Excellent - very well made and presented.